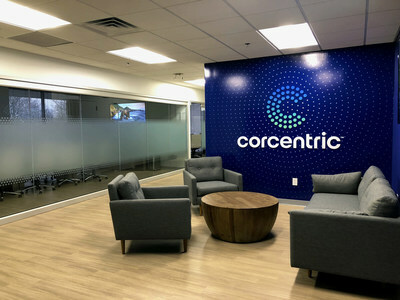 CHERRY HILL, N.J., Feb. 14, 2019 /PRNewswire/ -- Corcentric, a fast-growing provider of procurement and financial process automation solutions, today announced they have relocated their headquarters to better accommodate the needs of a rapidly growing organization. The company's client base now exceeds 6,000 companies, reporting revenue of $103M in 2018. The new headquarters is located at 200 Lake Drive East in Woodland Falls Corporate Park in Cherry Hill, New Jersey. "For more than two decades, New Jersey has been our home and we're committed to continuing to grow in this state," said Matt Clark, Corcentric President and COO. "As more and more companies realize the efficiency and productivity gains enabled by modernizing their procurement and finance functions – and the cost-savings and better supplier relationships that go along with it – we expect the momentum we experienced last year to continue throughout 2019." In 2018, notable company milestones included unifying its AmeriQuest Business Services and Corcentric brands under the Corcentric name to more clearly communicate the company's commitment to delivering innovative procurement and finance solutions. The company also secured a $200 million senior credit facility, which is being used to support growth organically and via acquisitions in the US and abroad. Company growth was supported by the acquisition of Source One Management Services, based in Willow Grove, PA, which expanded Corcentric's sourcing and procurement services. This week, Corcentric announced two additional acquisitions, which increase its global footprint: signing a definitive purchase agreement with Determine, Inc. (OTCQB: DTRM), a leader in global Source-to-Pay and Enterprise Contract Lifecycle Management Cloud Platform solutions; and acquiring Netsend Ltd., a London-based company offering electronic billing, invoicing, and document distribution services to the FTSE 100 and global blue-chip companies in more than 50 countries. Corcentric is discussing these industry trends and outlook at its annual Corcentric Symposium, February 13–15 in Orlando, FL. Attendees will hear from a roster of industry executives and famous entrepreneurs, including Terry Jones (founder of Travelocity.com), Stephen Moore (renowned economist) and Bill Taylor (co-founder of Fast Company). About CorcentricCorcentric is a leading provider of procurement and finance solutions that transform how companies purchase, pay, and get paid. Corcentric's procurement, accounts payable, and accounts receivable solutions empower companies to spend smarter, optimize cash flow, and drive profitability. Since 1996, more than 6,000 customers from the middle market to the Fortune 1000 have used Corcentric to reduce costs and improve working capital. Learn more at corcentric.com, or follow Corcentric on LinkedIn at https://www.linkedin.com/company/corcentric.